I hope you enjoy these free Bingo Cards below! The easiest way to print these is to click here for the PDF version of the bingo cards . When you are there, just go to file and print! Piece of cake. You will need Adobe Reader (the latest version is recommended) installed on your computer in order to open and print these Bingo cards. You can get Adobe Reader here (a new window will open so you can download without leaving this page). Print off the cards above (there is an easy .pdf version you can print off) and cut them out. Print off one extra game card for your master copy. With scissors, cut up your master copy into the individual squares - each square with one word on it. Put these squares into a hat (or diaper bag) and draw them out one at a time during the game. Read the word on your square when you pull it out. Give your guests time to find the word on their card and place a game piece over the word. Then you draw out another square and read that word aloud, as before. This continues until someone fills in a row (vertically, horizontally or diagonally) and yells "BINGO!". These cards have names of typical baby shower gifts. There are 20 different cards to print off, each one is a different order (so that each guest gets a differently ordered card - otherwise everyone would win at the same time!) 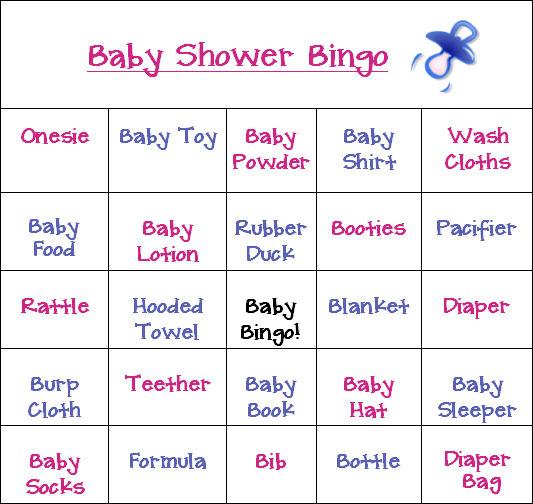 Print off a different Bingo card for each guest. Buy Hershey's Kisses or little plastic babies at a craft store for the game pieces (or M&M's, Hershey's minis, or other candy). You will need about 15-20 game pieces for each guest. 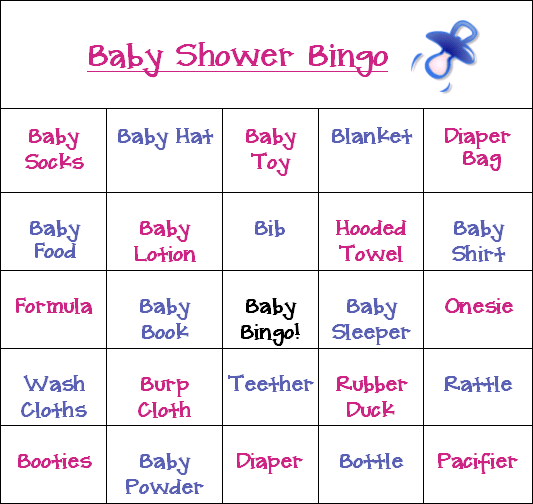 During the Baby Shower, hand each guest a bingo card and 15-20 game pieces. 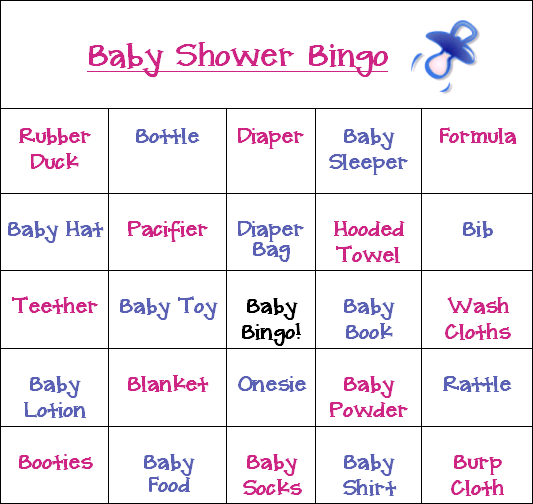 Instruct the guests that as the expectant mother is opening her gifts, they place a Hershey's Kiss or other game piece on their card if the gift is on one of the squares of their Baby Shower Bingo card. So, for example, if the mom has just opened up a package of onesies, then everyone would look on their card for "onesie" and mark that square with a game piece. Someone wins if they get 5 in a row, 5 in a column, or 5 in a diagonal. Keep playing even if someone wins in the middle of opening gifts; keep playing until all the gifts are opened. (Have multiple prizes because there will likely be more than 1 winner).